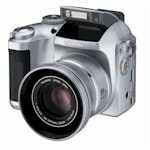 Digital cameras, once an expensive novelty, have become more popular than film-based cameras. They allow the user to take multiple shots of the same subject, almost instantly see the results, and adjust lighting and angle to resolve issues. Later on, the user can choose the best shot from the series and easily erase the rest. Because of these advantages, the quality of photography by the average consumer has improved significantly. In addition, pictures are becoming easier to share with friends and family. Most digital cameras transfer photos directly on to a PC where they can be printed, emailed to friends, posted on websites, or copied to CDs or DVDs. Also, professional printing of digital photos has become much easier over the past few years. There are now several online services to which you can upload pictures. They will print them out and mail directly to you. Or, if you like many photo shops and pharmacies will print out your photos while you wait. Additionally, photo kiosks are spreading rapidly through grocery and other stores. With a photo kiosk you can print out your digital photos in a few minutes. Flash Memory - Most cameras use a removable card with a special type of memory for storing the images. There are two types of cards: Sony and Compact Flash. 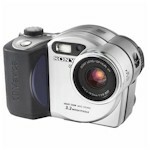 CD Storage - 2 Cameras (both by Sony) use a 3 inch recordable CD to store photos. These CDs can hold up to 156MB and cost about $2 a piece. Imaging Capacity - Range from 1 MP (Mega Pixel) to 8 MP. The large the number, the more clarity the pictures should have. A better clarity means that pictures can be made into larger prints and that there will be more options to crop and zoom digitally after the picture is taken. To make 4x6 or 5x7 prints the minimum suggested picture size is 1 MP. To make 8x10 prints the minimum size would be 2 MP. Optical Zoom - Typically range from none to 10x. 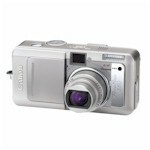 Digital Zoom - Most cameras have the feature to zoom in on the digital image. This can also be done later with PC photo editing software. A digital zoom will reduce the image resolution. LCD Size - vary from 1.5 to 2.5 inches (measured diagonally). The larger the screen the easier it will be to setup up and review you shot. Scene Modes - a button or knob to quickly set up the camera for common photo situations, e.g. night shots, fast-moving shots, portrait shots, landscape shots, etc. f-stop - the size of the lens opening (aperture). The higher the f-stop, the smaller the opening. Smaller openings are appropriate for situations with more light to prevent over-exposure. In addition, f-stop can be use to control the depth of field, that is, the area that is in focus. The higher the f-stop, the larger the area that will be in focus. Shutter Speed - the amount of time the shutter is open and light is hitting the optical device. Fast shutter speeds are ideal for action shots of fast moving objects. Slow shutter speeds are good for low light shots such as shots at night. ISO - is the digital equivalent to film sensitivity. A high ISO is good for dark subjects, a low ISO provides the best colors in situations with lots of light. Flash - almost all cameras allow the user to activate or deactivate the flash. Light User - takes pictures infrequently at family holiday gatherings and on vacation Choose a camera with at least 1 MP, no zoom, and no manual setting. Moderate User - someone with children or pets that make take 10 pictures a week Choose a camera with at least 3-5 MP, 3x optical zoom, scene modes. Heavy User - a person who uses the camera with work to photograph products Choose a camera with at least 5-8 MP, 3x optical zoom, manual controls.